Swing sets come in a variety of shapes, sizes and styles. They have been an integral part of children's playground and the modern swings unlike earlier models have better designs, are made using the best materials, and have safety features. 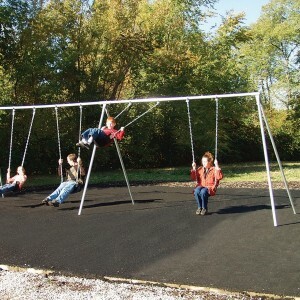 Modern swing sets are therefore not only better, but also safer for children. If you wish to add Swing set to your backyard, you need to have an idea of the size of swing set you want in relation to the available space in your backyard. With constant improvement in designs, modern swings take up less space; have conveniently arranged swings and they come in attractive colors which do not fade easily. Even though swing sets are favorite equipment for children, it was noted that the earlier designs could cause injuries to kids in case they fall. This was mainly due to the fact that the swings were made of metallic materials which made then uncomfortable to sit on. There was also risk of slipping and falling. Modern swing set design put much focus on safety and other essential features in swing play set. Investing in the right swing set will help you avoid common playground injuries while at the same time, offer you ample comfort during playtime. Currently, most swings that have been designed have taken into account all the necessary safety and comfort factors. Greater attention is put on things like keeping the edges smoother, and making the swing as comfortable as possible bearing in mind different age groups that might use the swing set. Height, movement and rotating angles of the swing are areas which have been improved in modern designs. Seating space of modern playground swing sets is very comfortable and are made from, plastic, rubber, flexible canvas, wood or heavy vinyl. Before purchasing swing set, ensure all components, accessories and engineered parts meets the safety guidelines that have been set by American society for Testing and materials and consumer product safety commission.